July 7, 2014 – Marcus & Millichap (NYSE: MMI), a leading commercial real estate investment services firm with offices throughout the United States and Canada, today announced the sale of Camelback Vista, a 200-unit apartment property located in Phoenix, AZ, according to Don Morrow, Regional Manager of the firms Phoenix office. The asset commanded a sales price of $5,125,000. 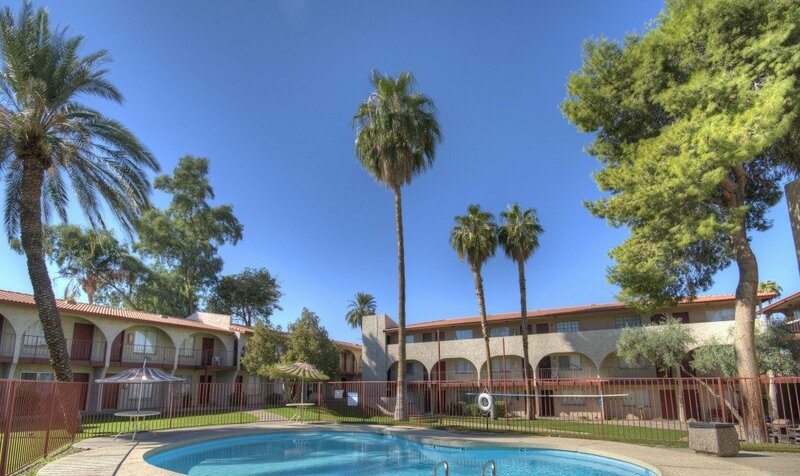 Rich Butler, Brian Tranetzki, Cliff David and Steve Gebing multifamily investment specialists in Marcus & Millichap’s Phoenix office, had the exclusive listing to market the property on behalf of the seller, a private investor based out of Texas. The buyer, La Fuente de la Comunidad, LLC, was represented by Todd Noel of Colliers International in Phoenix. Developed by Granada Construction in 1978, this 200-unit apartment community is constructed of block and stucco with a tile roof design. The subject property is composed of 96 studio apartments, 103 one-bedroom apartments, and one two-bedroom one-bath apartment. “With the sale of Camelback Vista, we expect rapid improvements to occur on site as well as changing the landscape of the Camelback corridor just west of Interstate 17. This should continue to bolster dynamic growth for the submarket.” adds Tranetzki.